Profile 00: Arado Ar-68F-1 (Red 1+N) of 10. (Nacht)/JG72, Oedheim/Heilbronn, September 1939 This aircraft was camouflaged in an uppersurface splinter pattern of 70/71 which extended well down the sides of the fuselage to meet a permanent black where the original 65 undersurfaces had been overpainted. Note the propeller blades are light grey on the fiont faces but black on the rear and that the national insignia on the uppersurface of the mainplane were either toned down or completely overpainted. Photo’s 01-02: These two views of another Ar-68F of 10. 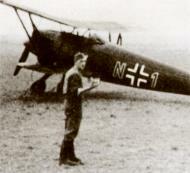 (Nacht)/JG72 which crashed in south-west Germany in 1940 clearly show the splinter pattern on the uppersurfaces, but this time apparently in 71 and 02. Photo 01: This photograph of Bf-109D-1s of 11. (Nacht)/JG2 was taken shortly after the German invasion of Norway in April 1940, and shows sailors of the Kriegsmarine with one of the Staffd's aircraft at Oslo_Fornebu. On May 1939, a single-engined night fighter Staffel was created with the formation of 10. (Nacht)/JG2 and in September, 11. (Nacht)/JG2 was formed by redesignating 10.(Nacht)/LG2. Also in September, a further single-engined night fighter Staffel was formed with the creation of 10. (Nacht)/JG26, but this was redesignated 12. (Nacht)/JG2 in December to form a full Gruppe, the IV(Nacht)/JG2, equipped with the Ar 68 F and the Bf 109 D-1. These early, single-engined night fighter units existed only for a short time before being disbanded or absorbed by the day fighter force. Note that the Ar-68 Fs (FAR RIGHT) were sometimes fitted with an early type of flame damper, shown more clearly (RIGHT). Although the Pik As, or Ace of Spades emblem, has led to the assumption that this aircraft belonged to JG53, it is believed that it was in fact operated by 10. (Nacht)/JG72, which had been formed in July 1939 from personnel of II./JG53. In February 1940, 10. (N)/JG72 was redesignated 12. (Nacht)/JG2 before finally becoming 6./NJG1 in June 1940. A similar emblem but showing an owl on a branch was sometimes employed by 11. (Nacht)/JG2.